Utah Jazz F Gordon Hayward’s slate of All-Star Weekend activities has gotten bigger following his announced participation in the Skills Challenge. Utah Jazz fans rejoiced last month when seventh-year star Gordon Hayward received his first bid to play in the NBA All-Star Game. However, Hayward’s activities won’t be limited to representing the Western Conference during the big game in New Orleans. Per an announcement from the league on Thursday, Hayward will be one of eight contestants in the Taco Bell Skills Challenge on All-Star Saturday Night. Joining Hayward in the contest, which tests a myriad of basketball skills ranging from passing and dribbling to three-point shooting, will be fellow All-Stars Anthony Davis of the New Orleans Pelicans, Sacramento Kings big man DeMarcus Cousins, Isaiah Thomas of the Boston Celtics and Washington Wizards point guard John Wall. Phoenix Suns guard Devin Booker, Kristaps Porzingis of the New York Knicks, rookie standout Joel Embiid of the Philadelphia 76ers will also participate. 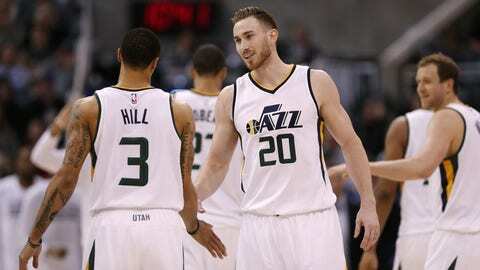 Hayward’s inclusion makes him the third Utah player to participate in the Skills Challenge. Former Jazzmen Deron Williams and Trey Burke both participated twice. Williams won the competition in 2008, while Burke was co-champion with Portland Trail Blazers star Damian Lillard when it was contested in a team format in 2014. This year’s Skills Challenge will be contested over the course of three rounds in a bracket-style, tournament format. The big men (Davis, Cousins, Porzingis and Embiid) will make up one bracket, while Hayward will join Booker, Thomas and Wall in the other. In related All-Star news, the league also announced participants for this year’s Three-Point Shooting Contest. Despite a push by the team to secure an invite to the event, Jazz wing Joe Ingles will not be among those competing. Ingles is currently second in the NBA in three-point shooting percentage at 44.4 percent.